UNITED NATIONS, September 28 -- As the UN General Assembly debate winds down, amid talk of repressed demonstrations this year in Iran and Honduras and elsewhere, almost nothing has been said about the Xinjiang Uighur Autonomous Region in western China. Inner City Press on September 28 asked Ekmelledin Ihsanoglu, the Secretary-General of the Organization of the Islamic Conference, for the OIC's action and views on what Ihsanoglu in his response diplomatically called the "July events." Video here, from Minute 40:18. While expressing "concern and sadness," and saying that it is OIC's mandate to protect Muslim minorities, Ihsanoglu went out of his way to praise China's "very good record with the Muslim world." He said OIC is "keen to preserve good relations." It is this keenness, for many countries springing from economic interests, that has led to the striking absence of commentary about one of the summer's main international news stories, that of the Uighurs. The keenness is not, according, returned. Unlike Russia, China has not even sought Observer status at the OIC, despite its Muslim population. 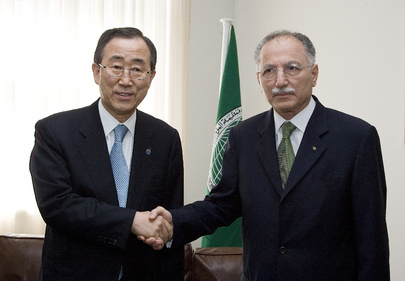 Ihsanoglu said that a delegation from the OIC was allowed to go to "Urumqi, only Urumqi, not Kashgar." Even with only this visit, he said the OIC has done more than any other group. He said other human rights watchdogs were silent, "I still don't understand." He answered Inner City Press, "Maybe you can help me to understand that." The answer is in Ihsanoglu's own phrase, being "keen to preserve good relations" with China. Inner City Press also asked for OIC's view of the Egyptian minister candidate's loss for the top post at UNESCO, a question Ihsanoglu declined to answer before turning to another questioner. Inner City Press has also wanted to ask him about the killing of Boko Haram's leader in Nigeria, the fighting in Yemen, and calls for OIC action on Kashmir, regarding which a closed door meeting was held later on Monday in the UN's basement. Even Gaddafi in his speech mentioned Kashmir, making all the more notable the silence on the Uighurs. UNITED NATIONS, September 23 -- While the talk of the UN on Wednesday has been Libyan Colonel Gaddafi's rambling hour and a half speech, ranging from jet lag to Lee Harvey Oswald, other leaders described as more sane also shamelessly use the UN as a stage. Take Spanish Prime Minister Zapatero, for example, whose staff controlled a press conference in the UN's briefing room such that half the questions were domestic Spanish politics. Against a blue UN backdrop, Zapatero defended as responsible his raising of taxes, put down other political parties not in the room to defend themselves, and tried as best he could to project gravitas. His spokesman, chewing gum and gesticulating to the UN TV staff to whom to give the boom microphone, chose one Spanish reporter after another. The final question, sounding like a set-up, was what does Spain want from the UN, how does Spain pursue its interests through the UN. 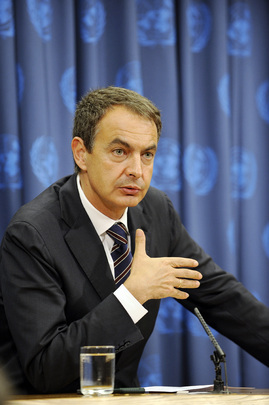 Zapatero, smiling, said the words united.... nations.... several times slowly, as if the mere words proved his point. Afterwards, Inner City Press asked first a Spanish mission staffer and the Zapatero's spokesman why it was run this way, why critical questions, unlike last year, were not allowed. The former scoffed that George W. Bush was asked, how does it feel to land on an air craft carrier? The latter shrugged when Inner City Press suggested that Zapatero should be asked for his view of, for example, the leaked memo of Norway's deputy ambassador Mona Juul, which criticizes the UN from the perspective of one who wants it to be stronger on human rights. In full disclosure, Inner City Press has human rights questions ready for Zapatero, ones that a Spanish staffer strained to read. Hasta la proxima, pues. Watch this site. UNITED NATIONS, September 23, updated -- At the UN's entrance Wednesday morning, Robert Mugabe and then Hugo Chavez came in. Chavez came over to the crowded stakeout the Press was penned into, and even answered a few questions. Zelaya? He is "un valiente," a valiant. Chavez said he hasn't been to the UN General Assembly for three years, but he is hoping for "good speeches." One TV journalist yelled out, "Any books for President Obama?" The reference was to Chavez' gift of Chomsky to Bush. Inner City Press wonders, if not sulfur, what will it smell like? The second entering president to speak to the Press was Fernandez of the Dominican Republic, with what one photographer called an "insanely large" entourage. As he spoke about coup d'etat -- presumably, Honduras -- a trio of journalists with "Turkmenistan" emblazoned on their jackets grumbled. Who is this guy? Update of 9:32 a.m. -- security tells the Press, Obama will arrive in two minutes. The Press is locked in the stakeout. As we wait, Inner City Press is asked, why does Brazil always speak first? A UN staffer answers, the first GA president did it, and they've kept the tradition. During the wait, a UN security officer tells TV camera people to stop standing on the chairs. When they ignore him, he starts taking the chairs. The camera people just push closer to the front edge of the stakeout. Even diplomats are stopped for a time from entering. A Sri Lankan diplomat flashes her "secondary pass," but the security officer shrugs. You have to wait just like the others. Entourages pour in. Update of 9:40 p.m. -- the two minutes have turned to eight. Now a security officer says, in Spanish, cinco minutos. Then, diez minutos. There is a strangely near reverential lull and silence. Update of 9:42 a.m. - Gaddafi comes in. "What is your message to the people of Britain?" one journalist shouts out. Gaddafi is flashing theV peace sign -- for the record, two fingers. He is trailed by women in combat fatigues with long black hair. Update of 10:31 a.m. -- a press conference by the spokesman for Japan's new prime minister, which was scheduled to start at 10 a.m., has been delayed. Deferred, one might say, out of deference, not wanting to overlap with Obama. Perhaps its that no repoters would go to the Japanese presser at this time. The next is Spain's Zapatero at noon. 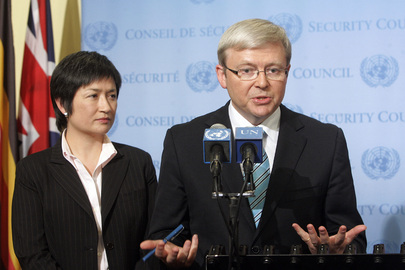 UNITED NATIONS, September 22 -- With the internment camps in northern Sri Lanka still full, Inner City Press on Tuesday asked Australian Prime Minister Kevin Rudd what his country will do, including since Australian UNICEF staff member James Elder was ordered expelled from the country for speaking of the detainees' plight. Video here, from Minute 11:28. Rudd, after answering about climate change and the UN's use of peacekeepers from militarily-ruled Fiji, said Australia is "monitoring human rights" in Sri Lanka and will take the "necessary action with respect to any individual." Video here from Minute 13:11. Even less firm was an answer by the UN Spokesperson's Office, when asked what if anything Lynn Pascoe accomplished in Sri Lanka about the two UN system staffer who were grabbed up by the government and, they say, tortured. Spokesperson Michele Montas said, twice, the Pascoe had "raised" the issue to President Mahinda Rajapaksa. But what is being done? Inner City Press asked, again, if it is the UN's position that it national staff are immune, at least within the scope of their employment for the UN. Ms. Montas declined to answer, saying that lawyers have been provided for the two staffers. On whether the UN in Sri Lanka, as it does elsewhere including Sudan, assert immunity, Ms Montas said, "I will have to find out." Video here, from Minute 13:18. Later on Tuesday, the UN Spokesperson's office issues three separate statement about Sudan. 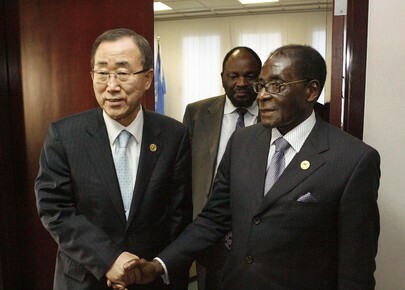 But nothing about Sri Lanka... Secretary General Ban Ki-moon was grilled about Sri Lanka over the weekend. One wonders how, then, simple questions like those posed on September 18 can remain unanswered. Footnote: UK Foreign Minister David Miliband is said to be arranging by invitation only press briefings on September 23 inside the UN. It is not clear if any Sri Lanka follow up question will be asked or even allowed. Watch this space. UNITED NATIONS, September 17 -- Having been widely criticized for weak handling of civilian deaths and detentions in Sri Lanka, the UN administration of Ban Ki-moon now seeks to control its message and limit questions, to turn the tide of negative coverage in the run-up to next week's General Assembly meeting. At a purportedly unscripted questions and answer session with the UN press corps on Thursday, Ban Ki-moon began by reading out a statement, including on Sri Lanka. But then no questions on Sri Lanka were taken or allowed by Ban's Spokesperson Michele Montas. It seems obvious that if an issue is deemed important enough by the UN, even belatedly as with Sri Lanka, to be one of the few country specific issues in the Secretary General's opening statement, a question should be taken on the issue. Ban's opening statement did not mention, as he himself has not, the video that emerged weeks ago depicting the Sri Lankan Army performing summary executions. Inner City Press has asked his Spokesperson's Office for his response, and received only indirect, roundabout comment. Thursday's canned opening statement did not mention a story that came out well in advance of Ban's statement, that even of the 10,000 people recently removed from the internment camps in Vavuniya, half of them were merely moved to other camps further away. "I was there when the UN secretary Ban Ki-moon came in. He stayed there for about 10 minutes and just went. Why didn't he go into the camp and talk to the people and spend some time asking them what their problems were? I thought he has a responsibility and people were expecting something from him. They expected much from him and he just spent 10 minutes and that's it." 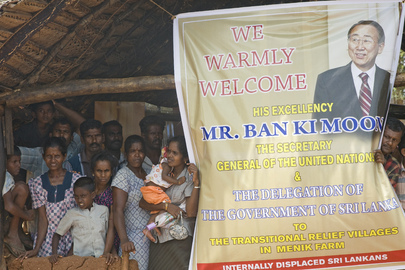 "Mr. Pascoe, accompanied by the Deputy Minister of Foreign Affairs, Hussein Bhaila, visited Mannar, where he witnessed preparations to construct a water reservoir for resettled communities, and received a briefing and demonstration by the armed forces on progress in clearing mines from the surrounding Mannar Rice Bowl region.... Secretary General Ban Ki-moon today voiced his concern about developments regarding the IDPs, as well as the political process and a possible accountability mechanism for alleged human rights violations committed during the armed conflict. Speaking at his monthly news conference in New York, Mr. Ban said he had discussed these issues with President Mahinda Rajapaksa." At the cited "news conference," Ban read out a statement about Sri Lanka but took no questions on this, his one country-specific critique... In his previous two news conference, Sri Lanka questions got in only because a TV correspondent voluntarily transferred the question he was given. Will the UN's tightly controlled spin be enough to bury the issue during the General Assembly meetings? We'll see. Watch this site. UNITED NATIONS, September 17 -- It was a night of fish balls and denials, high above the UN. In a 38th floor that the government of Sri Lanka has rented for seven years now, the country's new Ambassador to the UN Palitha Kohona invited and greeted members of the UN press corps, urging them to eat his chips and fish balls, drink wine red or white or orange juice. Inner City Press attended as one might a car crash: it was impossible, after seeing the barbed wire rings camps of Vavuniya and the bombed-out bloodbath on the beach not to accept an invitation to see the Sri Lankan government's other Janus face. Kohona shook hands for over an hour, telling the same story more than once. He recounted how good the view had been when he worked for the UN, on the 32nd floor in the Treaty Section. He didn't do it for a salary, he said, but rather for the feeling of knowing he was helping a child somewhere in the world. Inner City Press asked how long the people in the camps would remain locked up. Let me tell you, Kohona said, the bulk of them will be home by the end of the year. What about reports that of the 10,000 who recently left Manik Farms, over half were simply taking to other camps? Kohona called that mischievous, of course there are interim camps. He asked pointedly about the victims of Hurricane Katrina in the U.S., those still not returned home. UN High Commissioner for Human Rights Navi Pillay has said both sides in Sri Lanka may have committed war crimes. Even after that, Kohona claimed that no one in the UN system had criticized Sri Lanka. Inner City Press asked him, isn't the UN High Commissioner for Human Rights part of the UN? No, Kohona answered, she has a different status. What about UN children and armed conflict adviser Radhika Coomaraswamy? She is closer to the UN, Kohona said. There are rules about what she can say. Top UN humanitarian John Holmes, when he went to Sri Lanka early in his term, was called a "terrorist." His statements, it seems, changed after that. Kohona spoke about the meetings in Kandy in May, which Inner City Press witnesses, when cameramen told John Holmes to sit down and not block the view of the Rajapaksa brothers and of Ban Ki-moon. He's not used to that, Kohona said. He's not only a UN official but also a Sir, Sir John Holmes. The apartment, despite the view, had a looted feeling. There was empty spaces on the walls with electrical outlets behind them. I am bringing my belongings, Kohona said, referring to a sound system. He denied that the UK had refused him a visa. He justified the government's expulsion of UNICEF Spokesman James Elder, an Australian, saying Elder violated UN rules by speaking out. Some say Sri Lanka listens in on the UN. We will have more on this and other on-the-ground developments in Sri Lanka. This article strives to just describe a surreal evening in UN world. Kohona was naturalized as Australian, and was seconded to the UN by that country's foreign service. After four year he was supposed to return, but he says his boss Hans Corell urged him to stay. He did, for another six years until Mahinda Rajapaksa invited him to return from the diaspora to "live in a gilded cage, surrounded by guards" and put words on his final assault. There are stories still circulating in the UN, which will be told another time. Kohona bragged Thursday how he put the treaties online. It is password protected, some pointed out, but they are online. Inner City Press asked about about the Convention on the safety of UN Staff members, referring to the UN system staff detained and they say tortured. Kohona did not answer. He chatted up interns, he glad handed long time correspondents. It seems light years away from the video depicting the Sri Lankan Army performing summary executions. It was talk of views, or carrots and dip and fish balls. Take one, Kohona said. They are a Sri Lankan delicacy. He said he will be UN active. This is something we will cover. UNITED NATIONS, September 16 -- In Sri Lanka, the UN funds and works in what the government calls welfare centers and others characterize as internment camps. From these camps, the government removes people it thinks have supported the Liberation Tigers of Tamil Eelam rebels. Also, according to BBC and others, pro-government militia groups "disappear" internees in what are called dolphin vans. The UN's positions on these issues are not clear. At a Wednesday news conference, Inner City Press asked top UN humanitarian John Holmes if there are militias in the camps, and if it knows and tries to raise toward international standards the government's protocols for grabbing, arresting and taking away people in UN-funded IDP camps. Video here, from Minute 31:58. Holmes said that while allegations about disappearances are made in the media, they are not heard from UN agencies or "from NGOs." This last seemed strange, since Inner City Press has been told about the disappearances by just such civil society sources. Given the government's willingness to deport NGO staff and even UNICEF's Colombo based spokesman, these groups are afraid to speak. So is the UN itself investigating the troubling allegations? It is not clear. Even on the incontrovertible process of "screening" and removing people from the IDP camps, Holmes said the UN can do little. It is their right, he said, referring to the Sri Lankan government. In fact, Holmes seemed to only be asking that the detentions and removal proceed more rapidly, so that "legitimate" IDPs can go and stay with host families. He said there are at least 10,000 people in "rehabilitiation" camps, and he claimed that the Red Cross can visit all of them, something that's disputed on the ground. Clearly, the Sri Lankan government has vigorously pressed the UN to acknowledge that can do whatever it wants, up to and reportedly including detaining and torturing UN system staff members. Now we have reached a point where the UN defers from even commenting on due process for people in UN-funded IDP camps, and only says that the government should do its culling more speedily -- that is, in a sense, with even less due process. Send in the dolphin vans! UNITED NATIONS, September 16 -- While two UN system staff members remain incarcerated in Sri Lanka after what they say was government torture, in New York the UN is preparing for more countries to sign more treaties and conventions during next week's General Assembly. Inner City Press asked top UN lawyer Patricia O'Brien, during her news conference Wednesday promoting the treaty event, about the two UN system staffers. Video here, from Minute 42:01. The Treaty Event booklet distributed at the UN lists the Convention on the Privileges and Immunities of the UN and the Convention on the Safety of UN and Associated Personnel. Sri Lanka has acceded to both of them, during the General Assembly meetings in 2003. But are they being complied with and enforced? "I am not here to speak about enforcement" of the Conventions, Ms. O'Brien said. She referred to the UN's ironically titled "depository" role, and that she also advised the Secretary General on the "application of treaties." But where do these interpretations go? In Sri Lanka, the country head for the UN made belated statements about the disappeared staff that many thought ignored the government's responsibility under the Conventions. Amin Awad did not assert that the staffers were immune, at least within the scope of their work for the UN, but only that the government should inform the UN of the detention. "We are not going to get into interpreting specific provisions," Ms. O'Brien said. 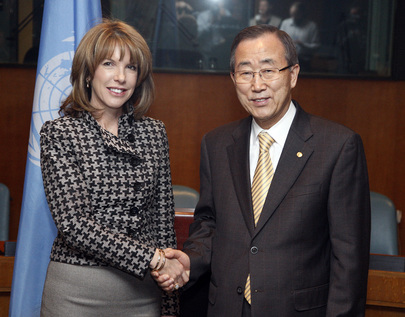 Recently Secretary General Ban Ki-moon, under fire for weak performance including in Sri Lanka, convened his Under Secretaries Generals including Ms. O'Brien and her Political Affairs and Peacekeeping counterparts. 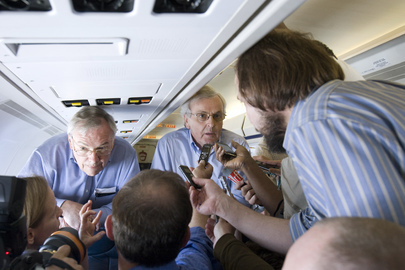 Afterwards the Press was told that these USGs will be taking questions more often, to explain the UN's positions. Some thought this responded to a part in the leaked memo by Norwegian diplomat Mona Juul, that Ban has chosen weak or faceless USGs. But if the UN wants to get its position out, how can its top lawyer try to limit a rare press conference to the treaty event, not even the treaties themselves? There are also questions about the UN's involvement in the Cambodia genocide tribunal, Somalia piracy enforcement, policing the (further) abuse of the UN's name, including for commercial gain, and of the UN's and OLA's commitment to freedom of speech and of the press. To run from these questions, news conferences are now artificially limited. At the end, Ms. O'Brien tried to explain her refusal to answer basic policy questions by saying since she advise Ban on some matters, it is all cover by attorney client privilege. This is not a defense or justification used by the chief legal officers of other international organizations, and it ill-serves the UN, human rights -- and UN staff and the rule of law. Watch this site. Footnote: on the lighter side, Inner City Press asked Ms. O'Brien about the incident in July in which William Kennedy Smith, at the event at which the U.S. signed the Disabilities Convention, asked for the ceremonial pen. He was refused and told that the UN has only one pen. Inner City Press asked, does the UN have only one pen? Video here, from Minute 44:28. Ms. O'Brien replied that the UN does not have a budget to give pens, not of this quality, but might seek a budget allocation. William Kennedy Smith actually offered to buy the pen, right there. Would that comply with the law? As on so many other things, the UN's top lawyer has no comment. UNITED NATIONS, September 14 -- On issues ranging from the detention of UN system Sri Lankan staff to the continuing detentions in the camps in Vavuniya, UN Under Secretary General for Political Affairs Lynn Pascoe is traveling to Colombo on September 15. Inner City Press asked Pascoe if, for example, he would also raise the video footage depicting the Sri Lankan Army conducting summary executions, and if he had seen the footage. Pascoe said yes, he has seen the film, and that issues of "accountability" will be raised. Video of press briefing here, from Minute 38:02. Pascoe said that accountability and investigations are "all best done if done internally." But the Mahinda Rajapaksa government has ended the investigation of the killing of 17 Action Contre La Faim aid workers, and immediately denied the video the day that it first aired. So what internal "accountability mechanisms" will Pascoe be suggesting? Pascoe said that the "range of human rights issues" need to be discussed, and that there is blame on all sides, "there is enough to go around." Afterwards Inner City Press asked Pascoe if he will be traveling to the internment camps at Manik Farm, and who will be accompanying him. He said his "program" is still being negotiated, and that people from his Department of Political Affairs and the UN Office for the Coordination of Humanitarian Affairs will join him. 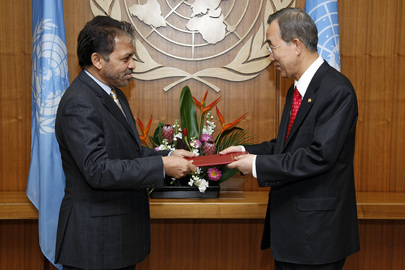 Not mentioned, in the press conference or in response in the hall afterwards was Secretary General Ban Ki-moon's chief of staff Vijay Nambiar, whose objectivity was question in connection with his early trips to Sri Lanka, particularly after his brother Satish wrote an op-ed praising the strategies and acts of Sri Lankan General Fonseka, who led what even the UN's John Holmes characterized as a "bloodbath on the beach." Pascoe said his visit would follow up on "earlier trips by John Holmes and others" -- notably omitting Nambiar's forays. To some, the sudden trip seems not unrelated to recent criticism of Ban Ki-moon's performance, including in the leaked memo of Norway's Deputy Permanent Representative to the UN Mona Juul. UN's Pascoe faces taped questions on plane to Sri Lanka in May, is internal accountability best? Another example of weak handling from the Secretary-General’s side is the war in Sri Lanka. The Secretary-General was a powerless observer to civilians in their thousands losing their lives and being driven from their homes. The authorities in Colombo refused to receive the Secretary-General while the war was going on, but he was an honored guest -- and he accepted the invitation -- once the war had been “won.” Even though the UN’s humanitarian effort had been active and honorable enough, the Secretary-General’s moral voice and authority have been absent. The memo also criticized Ban for choosing weak Under Secretaries General and not allowing them to talk. Suddenly, this week there are press briefings by Pascoe, Alain Le Roy and Susana Malcorra. Two other Ban advisers spoke Friday, but only on background. And still not Gregory Staff of UN Security, nor UNDP's Helen Clark nor Ann Veneman of UNICEF, whose Colombo based spokesman James Elder is being thrown out. Have Ban Ki-moon and President Mahinda Rajapaksa, unlike Ban and Myanmar Senior General Than Shwe, agreed in advance to some photogenic win-win outcome of Pascoe's trip? Perhaps for Elder to be able to remain, or some symbolic release of some of the detained, albeit not to the regions they came from? We'll see -- Pascoe said to ask him "Friday or Saturday," so the UN should provide a read-out then. Watch this site. Footnote: before Pascoe spoke, Ban's Deputy Spokesperson Marie Okabe answered yes when Inner City Press asked for on the record confirmation of its earlier story of Ban's telephone call to Rajapaksa. Pascoe then described the call as straight forward, saying that Ban and Rajapaksa "have a very good relationship."